Designed to please both you and your cat, Mr. Herzher’s Seat Perch for Cats is the ultimate spot for a catnap in style. 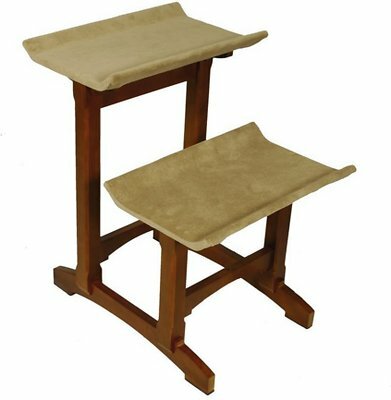 Made from a durable microfiber fabric that is easy to clean, this seat perch is an appealing alternative to the traditional cat tower. It’s easy to assemble with your choice of a single or double lounging area, which measures 20 x 13 inches each. The spacious area features raised edges and a plush cradle, so your cat can reign over his kingdom in total comfort and safety. Plus, you can count on a lifetime of sturdy performance, and the built-in felt pads protect your hardwood or tile floors. Stylish cat perch available with one or two plush seats. Each spacious lounge area measures 20 x 13 inches and accommodates one large cat or multiple small ones. 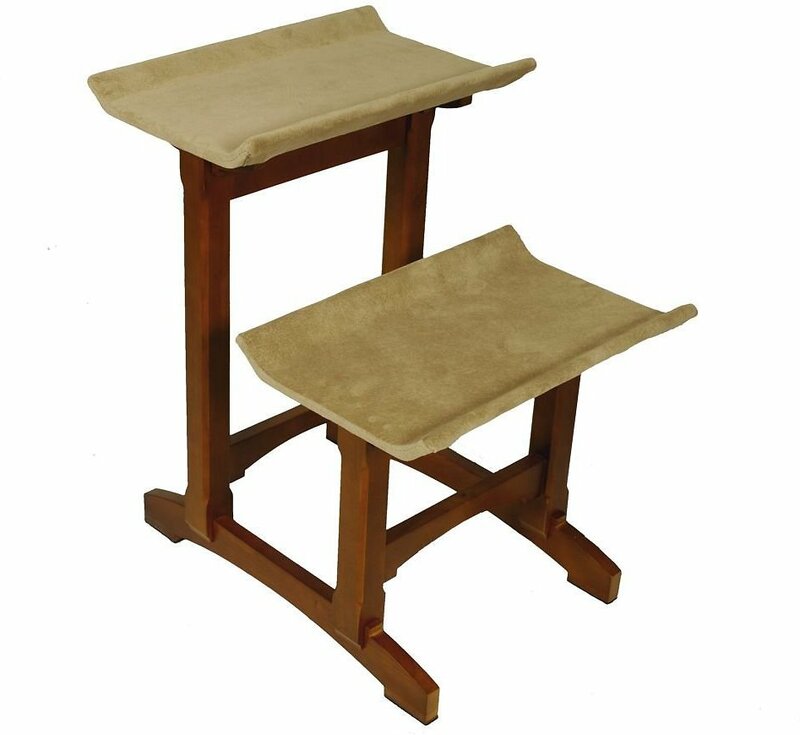 Made from durable and easy-to-clean microfiber with solid wood construction for a long-lasting perch. Protective pads prevent scratches, chips or dents on any floor surface. 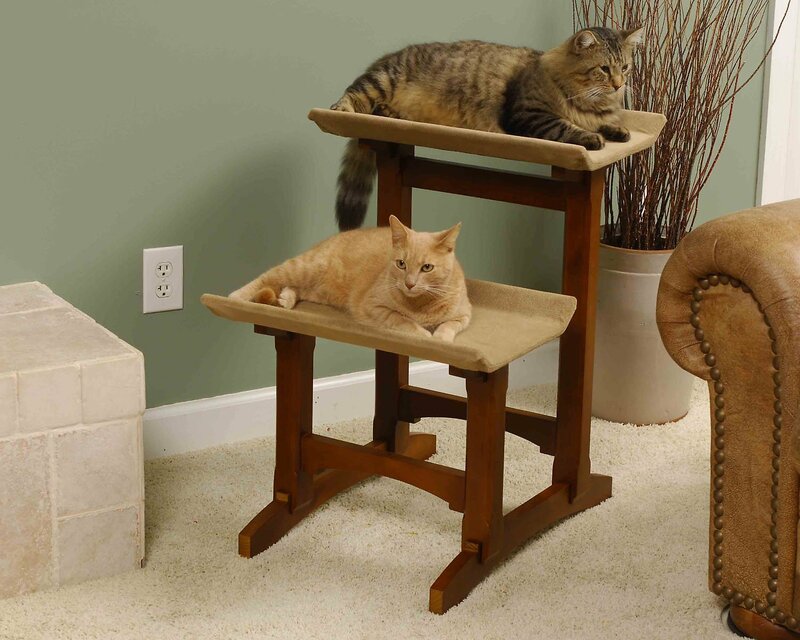 Made specifically so your cat can reign over his kingdom in total comfort and safety. (4) Seat Supports, (2) Seats, (2) Feet, Short Leg Assembly, Tall Leg Assembly and Hardware Package. Clean wood surfaces with furniture polish. Clean fabric with upholstery cleaner. We used to have our cat's bed on an ottoman by the window...moved to a new place and the heat/AC vent was in front of the window. This perch gives her a view from the window without blocking the vent--a WIN for everyone! I haven't seen any of the cats on the lower perch but it makes an easy step to their prime viewing spot. Be sure to tighten all the screws really tight to help with the wobbling - hasn't been a problem once we did that. I'm thinking about buying a second one for another spot in the house. So within 2 minutes of putting this together my cats were all over it!! Very sturdy as we have several cats of different weights and sizes two of my younger cats lay together and watch the birds and squirrels all day long. May even get another one for another room for them to enjoy!!! I was so pleased with this at first, easy to assemble and my cat adored it. But I've had it three months now, and it's no longer sturdy enough for my cat to jump on safely. I've tightened the screws multiple times, even tried gluing it, it's all no good. The thing wiggles all over the place when my cat tries to jump on it to look out her window. It makes both of very sad. I think it's basically just not well designed. What I liked about this product was the fact that it was not too high to have my kitties jump down and hurt themselves. Also, the two-tier is nice and the tiers are nice and wide. Some purchasers commented that the tier material is not washable ... what I do is put two pillowcases over them and secure on the bottom with a couple of safety pins or good tape. This way it keeps clean. Also, it's attractive like a nice piece of furniture. This is a sturdy and attractive kitty perch. Well made, sturdy and kitty approved. I received my item as scheduled. It was very easy to put together. Once assembled it was very nice looking. The perches are roomy;I have one pretty large cat at 20lbs and he fits nicely. The only complaint I might have, although I knew this; is I wish it was just a little bit taller. The higher of the two seats allow one of my cats to look out the window, but the lower seat does not cut it. So this does cause the two to duke it out for the top seat (and needless to say the big male always wins over my little girl! What is up with that?). Anyhow I would recommend this product. This was purr-fect for two months then the lower shelf legs broke. Not catified with this product. Looking at other cat trees that are much sturdier. I am so happy with this item, it looks like a nice piece of furniture in my living room, was very easy to put together and is very sturdy, which is important since I have two very big boys. Well made & worth the cost. I bought this piece to go in my living room by the window. It looks more like a piece of furniture than carpeted cat trees. My cats have used it since the day I put it together. It's the perfect height to sit by a window. I bought the double seated perch as I have three cats. When the cats lay, they lay on the top perch, but they play one on the bottom, one on the top. The piece was easy to assemble and I had it together in about 15 minutes. It comes with a soft cover, but the seat is not very padded, so I added matching blankets to each seat. My cats like it either way. It's exactly what I needed. It arrived quickly, too.